As I mentioned before, when you specialize in writing about Christmas on TV, you also research and write about music. 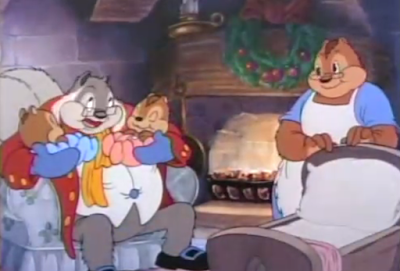 Christmas TV episodes, specials and movies are loaded with music and carols. As a pop culture junkie, I love picking up soundtracks to holiday programs and collecting vintage record albums. Along with albums, I also have a collection of Christmas music CDs. I thought it might be interesting to share some of these CDs and talk about them. 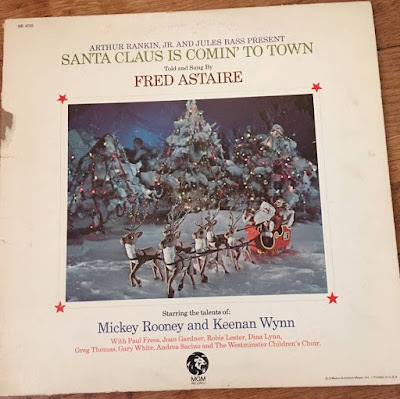 Just to be clear--my collection focuses on Christmas records with a television or film tie-in. I have 1971's A Partridge Family Christmas Card on vinyl too but I got it used and the pull-out card was always missing. I think I've had this CD for 20+ years. My favorite song on the album is the only original tune on the album "My Christmas Card to You." Fans of The Partridge Family TV series know that the songs "Winter Wonderland" and "Have Yourself a Merry Little Christmas" in the 1971 Christmas episode "Don't Bring Your Guns to Town, Santa" can also be found on this release. 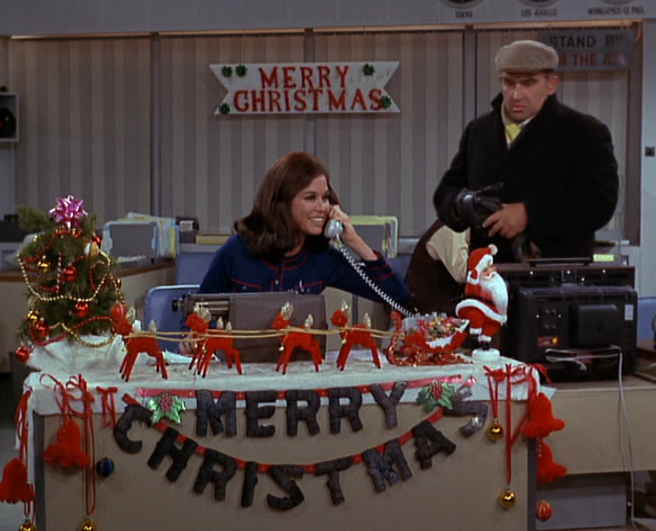 Check out my discussion of that 1971 Christmas episode again HERE. 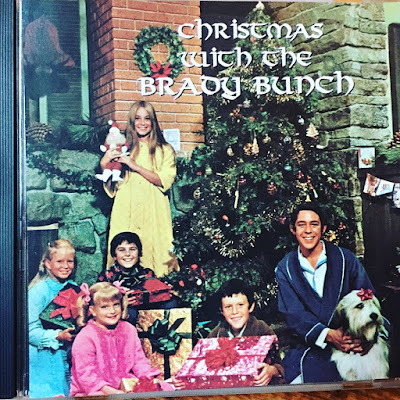 I also have this CD version of the 1970 vinyl release of Merry Christmas with The Brady Bunch. All the tracks are the same despite the slight album title change. The album features twelve traditional Christmas songs--no original compositions just for the Bradys. 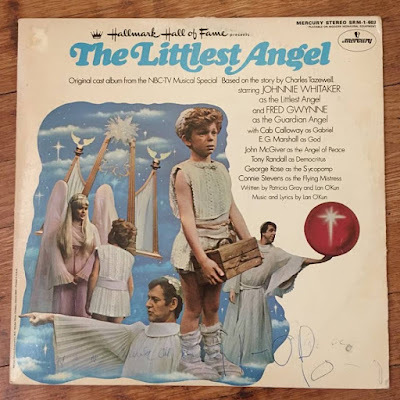 A missed opportunity: the recording of "O Come All Ye Faithful" for the album features Jan's voice (Eve Plumb) and while it's a nice voice, TV fans may feel more connected to either mother Carol (Florence Henderson) singing the tune--as she did in the 1969 Christmas episode, or even Cindy Brady (Susan Olsen) taking the lead since she's featured so prominently in the only Christmas episode of the series. Oh, what could have been! Check out my discussion of the 1969 Christmas episode of The Brady Bunch again HERE. Speaking of family TV series, this CD is the second Christmas music release connected to The Waltons. 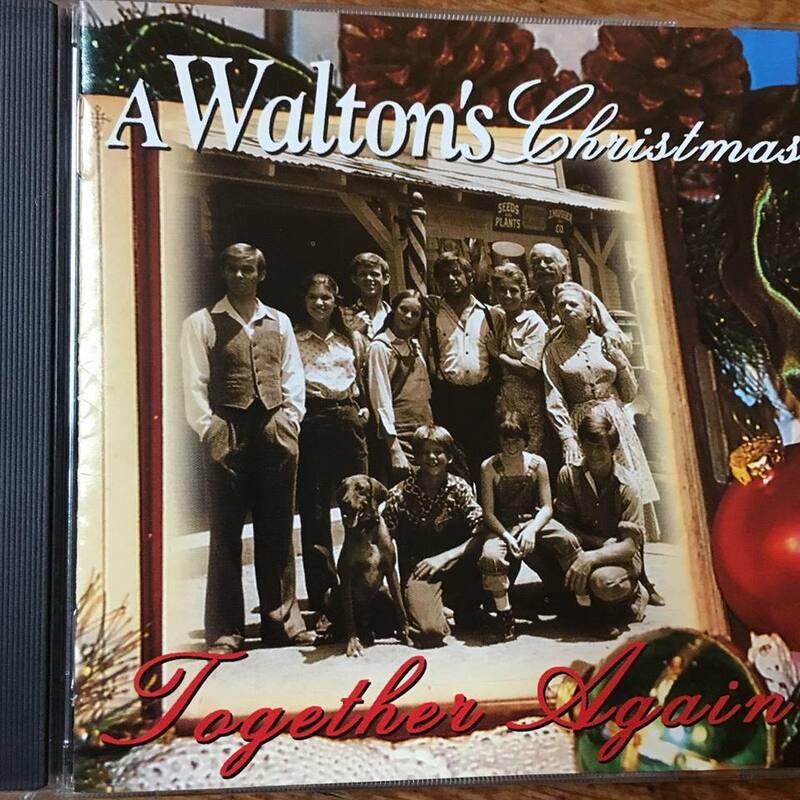 It should not to be confused with 1974's The Waltons' Christmas Album. That album--which I also have--is a collection of spoken-word stories by Earl Hamner Jr. and Christmas carols sung by a group called The Holiday Singers--not the original cast of the series. 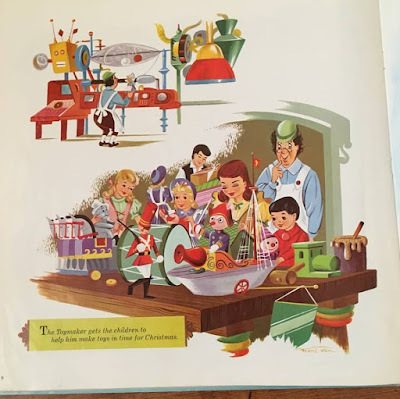 (There's even a yuletide story told by Will Geer who played Grandpa--it's wonderful!) 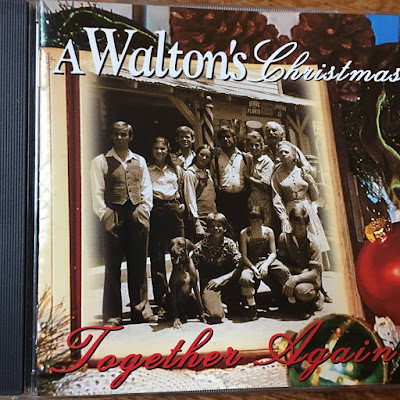 However, the 1999 CD A Walton's Christmas: Together Again features songs performed by members of the original cast! It was produced by Jon Walmsley--the actor who played Jason Walton, who is now a professional musician. The songs include traditional yuletide favorites, a couple originals written by Walmsley himself, and spoken-word segments too. Need to hear Richard Thomas (John-Boy Walton) recite the poem "Twas the Night Before Christmas?" It's here. I believe this was originally released on CD. Most TV western fans love Bonanza. Ever wanted to spend Christmas with the Cartwright family? I did--that's why I picked up this CD re-release of the 1960s album. 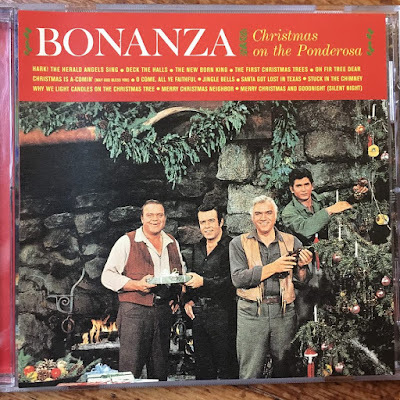 It's Ben Cartwright (Lorne Greene), Hoss (Dan Blocker), and Little Joe (Michael Landon) singing holiday favorites while decorating the tree and celebrating with friends. There's even one song "The New Born King" sung by Adam (Pernell Roberts) although they explain he's not at the party--he's out of town spending Christmas with relatives! I think my favorite tracks are "Santa Got Lost in Texas" sung by Little Joe, and "Merry Christmas Neighbor" sung by the entire cast. If you're not a fan of the original series, you probably won't get it. That's okay. Give it a listen, see what you think. I just picked up this CD in a used record store this past holiday season. 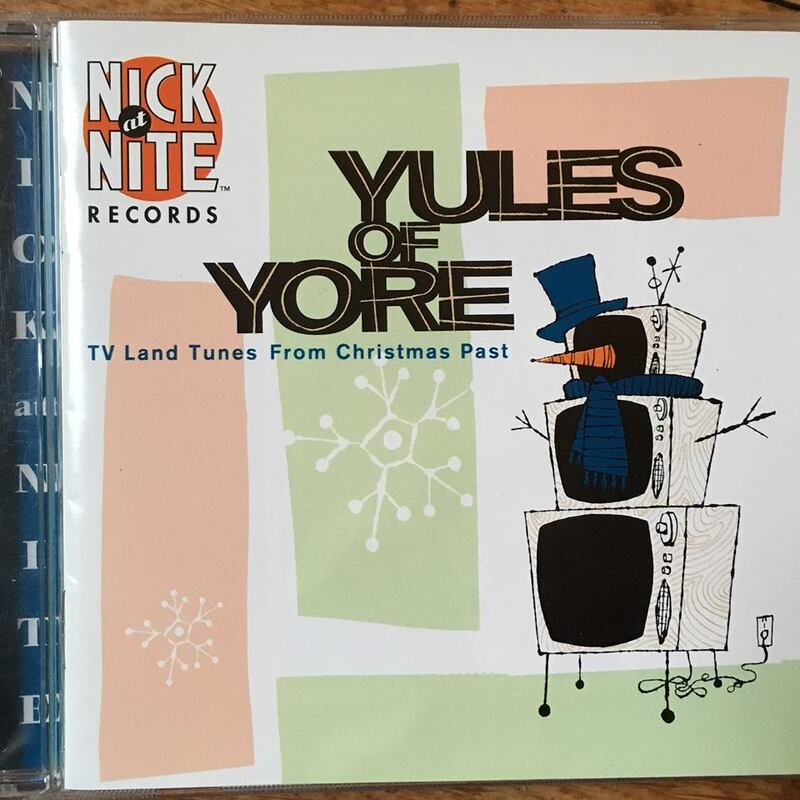 The 1999 release features 13 tracks of holiday songs but none are from the Christmas episodes of the TV series, to my knowledge. 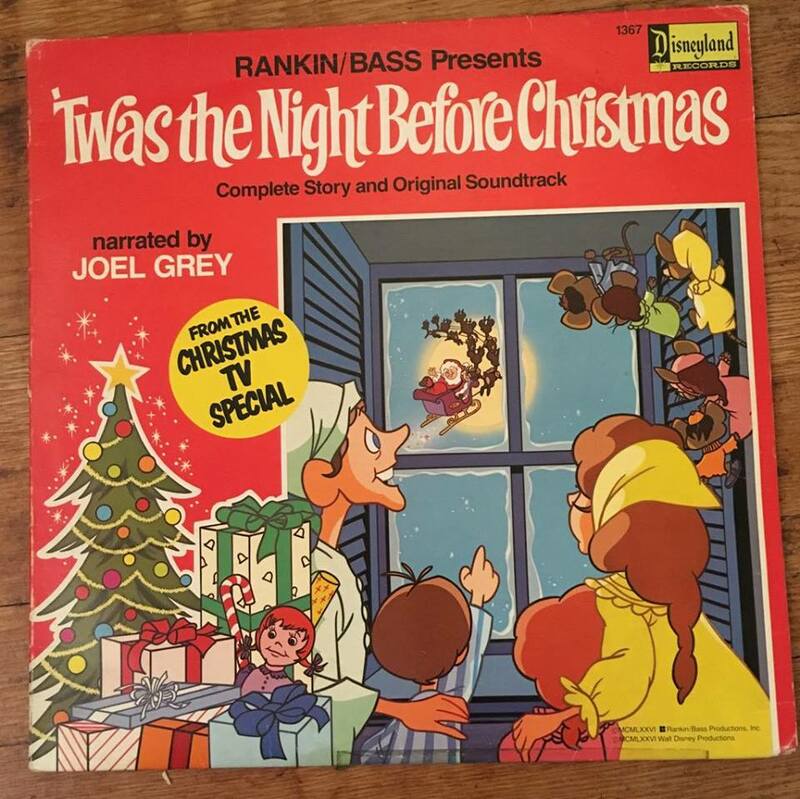 For example, the CD includes "God Rest Ye Merry Gentlemen"performed by Randy Travis, however I don't believe he sings this song in the several Christmas episodes in which he appears. (For those keeping track: Travis does sing "O Little Town of Bethlehem" and "Silent Night.") But the songs here are pleasant enough, and performed by world-famous recording artists, including Charlotte Church, Amy Grant, Kenny Lattimore, Donna Summer, Jaci Velasquez, and more. 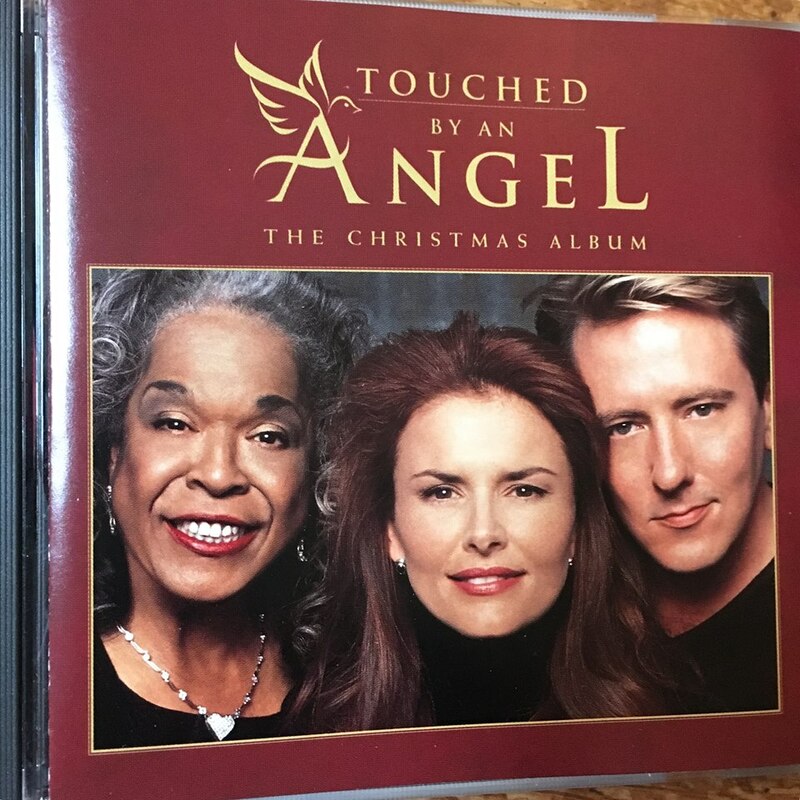 Fans of the TV series will be pleased with the first track which is "If I Can Dream" performed by Della Reese, and the last track which is "An Irish Blessing" featuring Roma Downey. This too was originally released on CD. This CD has been easy to find for quite some time. I've even seen it for sale during the holidays at Office Max!? I know. Who doesn't have a copy of this recording? 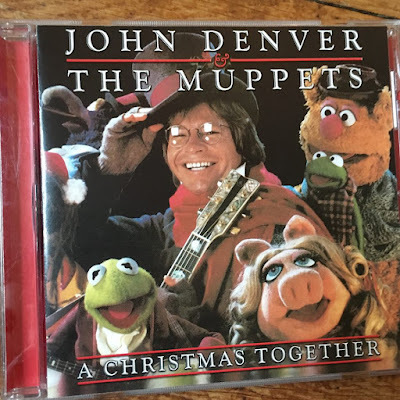 But I still meet people who don't realize it is the soundtrack to the 1979 Christmas TV special John Denver and the Muppets: A Christmas Together. Even more shocking is that the CD doesn't include all the tracks from the original vinyl release. Ugh! If you're an obsessed fan of the TV special like I am, then you know that the original soundtrack release doesn't include all the music from the special either. Four songs are missing. Missing are the songs "Pleasure of your Company" and "Camaraderie"--both were originally composed for the 1974 hit London stage musical The Good Companions, music and lyrics by Andre Previn and Johnny Mercer. Miss Piggy's song "I Will Wait for You" was originally created for the 1964 French musical The Umbrellas of Cherbourg. 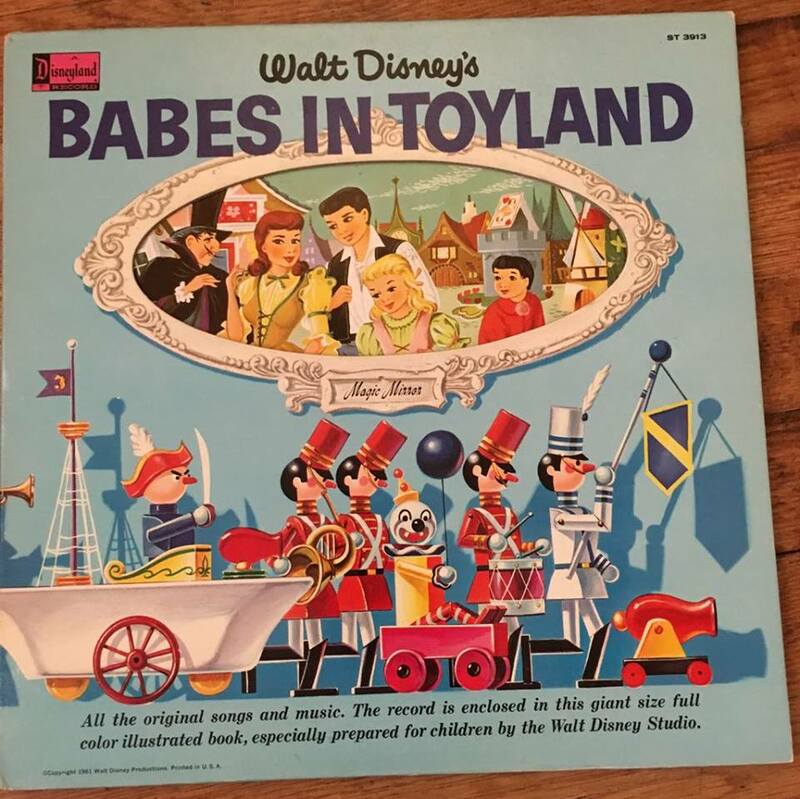 And the instrumental "March of the Toys" in the toy soldier performance with Denver, was first heard in the Victor Herbert operetta Babes in Toyland. Despite being incomplete, the CD is wonderful to listen to each year during the holidays. This CD was released as one in the series of Nick at Nite Records collections during the 1990s. This Christmas music collection is a set of fourteen holiday tracks recorded by TV stars and personalities, including Jimmy Dean, Mike Douglas, John Davidson, Arthur Godfrey, Jim Nabors, Neil Diamond, Richard Clayderman, Slim Whitman, and more. I've never been too impressed with this particular collection of Christmas music but I love the cover art's three-tiered snowman made from TV sets. I believe this was only released on CD. Do you have any Christmas music CDs connected to film or television? What's in your collection? Feel free to share your comments below. 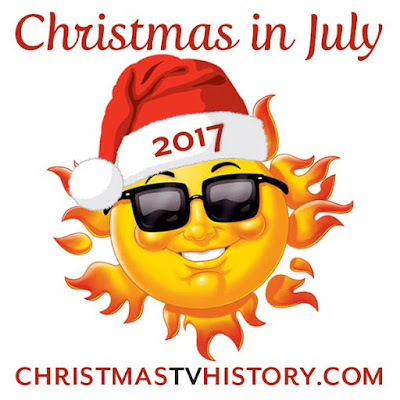 One thing I learned early in my research for the encyclopedia Tis the Season TV, when you specialize in writing about Christmas on TV, you also research and write quite a bit about music. 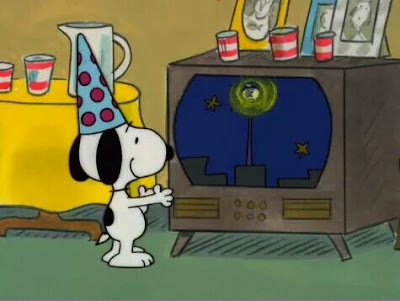 Christmas TV episodes, specials and movies are loaded with music and carols. 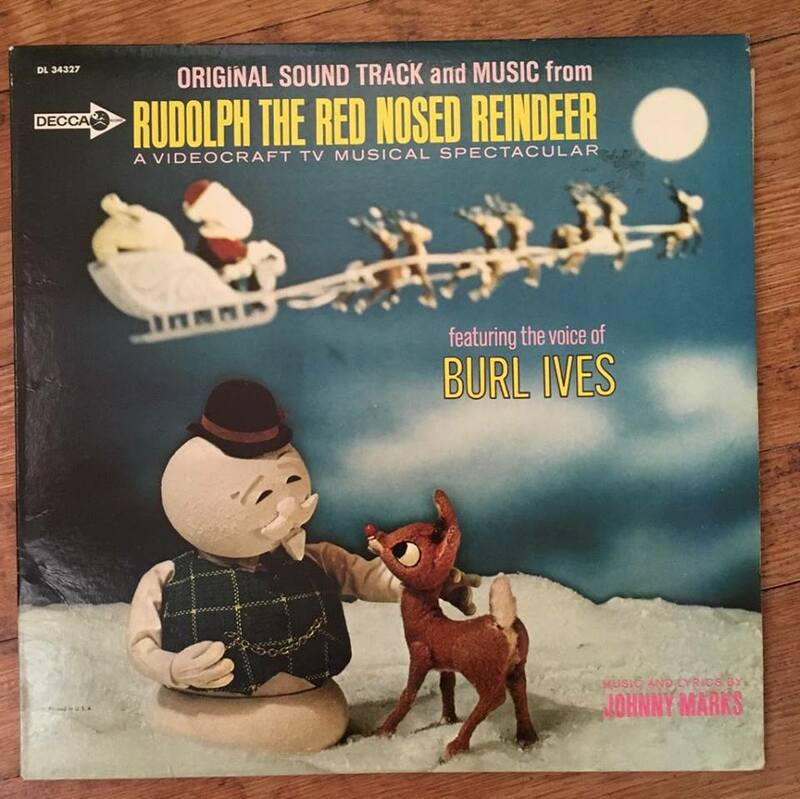 As a pop culture junkie, I love picking up soundtracks to holiday programs and collecting vintage record albums. As a researcher, I often turn to these official releases for help in the identification of songs and for more information about the music. They're also just cool to have and display in my office. Last summer on a trip to the Detroit Festival of Books, I picked up several vintage Christmas albums at a local record store. See that post again HERE. That post was so popular, I thought I'd share more of my Christmas record collection. 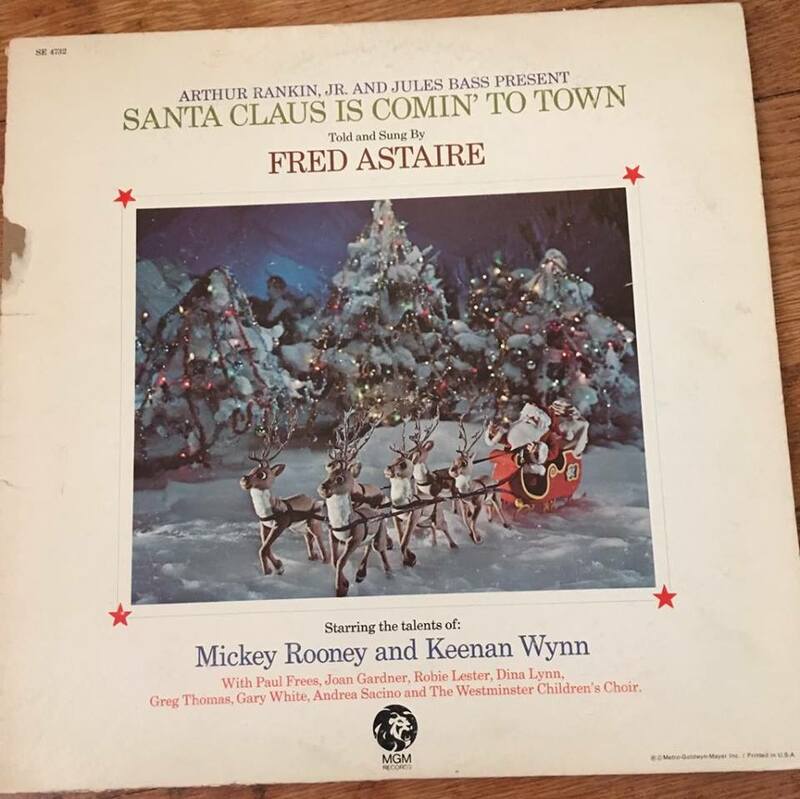 Just to be clear--my collection focuses on Christmas records with a television or film tie-in. Below are some of the records in my collection. Do you have a Christmas record with a television or film tie-in? Tell me about it in the comments below. Official soundtrack album--Decca Records. 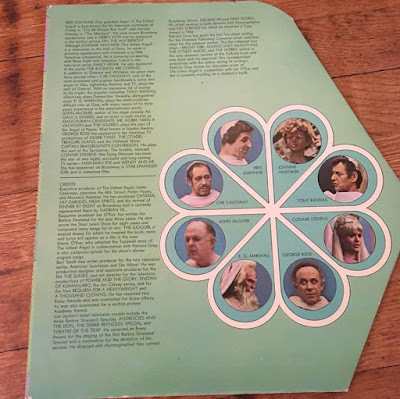 Back cover includes lyrics. If you're going to collect Christmas records with a television tie-in, your collection must include the original soundtrack to Rankin/Bass' 1964 animated TV special Rudolph the Red Nosed Reindeer. Lucky for me, this was a birthday gift from a friend a couple of years ago. It's nice to have friends looking out for me. Santa Claus is Comin' to Town soundtrack from 1970. Another Rankin/Bass favorite soundtrack is from the 1970 Animagic classic Santa Claus is Comin' to Town. My album copy is not in the greatest shape but I'm careful with it. I've had this record for decades--long before I was writing and researching Christmas entertainment. So glad I've held on to it. 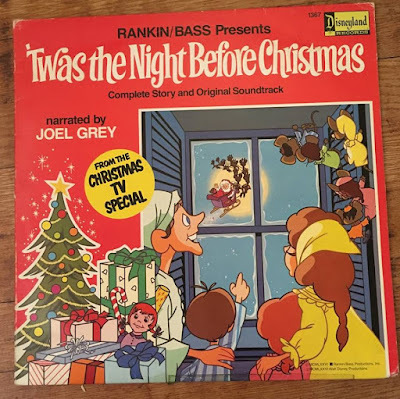 One of my more recent acquisitions is this Disneyland Records release of the story and soundtrack of the 1974 traditional cel animated, Rankin/Bass Christmas TV special Twas the Night Before Christmas. Do you have a favorite Rankin/Bass soundtrack? Last year in Detroit, I found the soundtrack to Rankin/Bass' Cricket on the Hearth--see that album cover again HERE. I'm still looking for the Rankin/Bass Frosty's Winter Wonderland soundtrack. Might as well try to complete the collection! 1977 release--dialogue, music, and storybook. This is another record that I've had in my collection for decades--long before I was writing about Christmas entertainment. It's just a fabulous pop culture item to have in any record collection. This album isn't a collection of the musical compositions written by the Vince Guaraldi for the Peanuts TV specials. Instead this is a recording of the dialogue and background music of the 1965 Christmas TV special. Sure Guaraldi's music is here, but the recording is the animated TV special's story and dialogue. 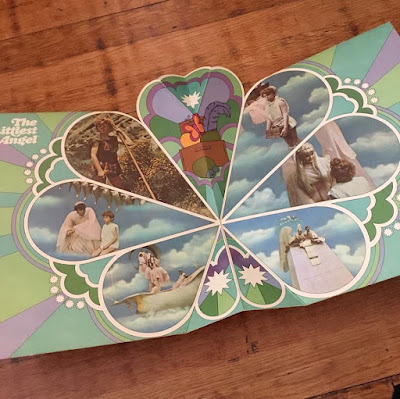 The twelve-page storybook within the album's covers complements the visual storytelling with the audio recording. I can still recall the excitement I felt for record-and-book sets like these, to experience the joy of TV specials seen only once a year. I'm also amazed that I found this LP--despite its condition. 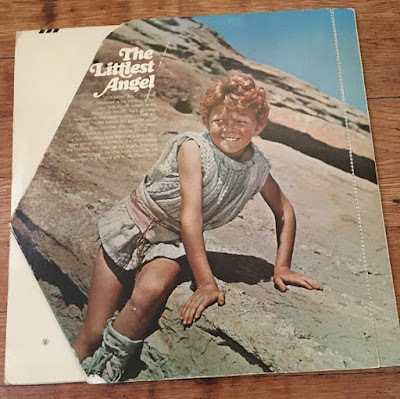 This is the cast album from the 1969 musical Hallmark Hall of Fame TV special The Littlest Angel. The cast for this NBC musical is amazing--Johnnie Whitaker, Fred Gwynne, Cab Calloway, Tony Randall, Connie Stevens, and more. 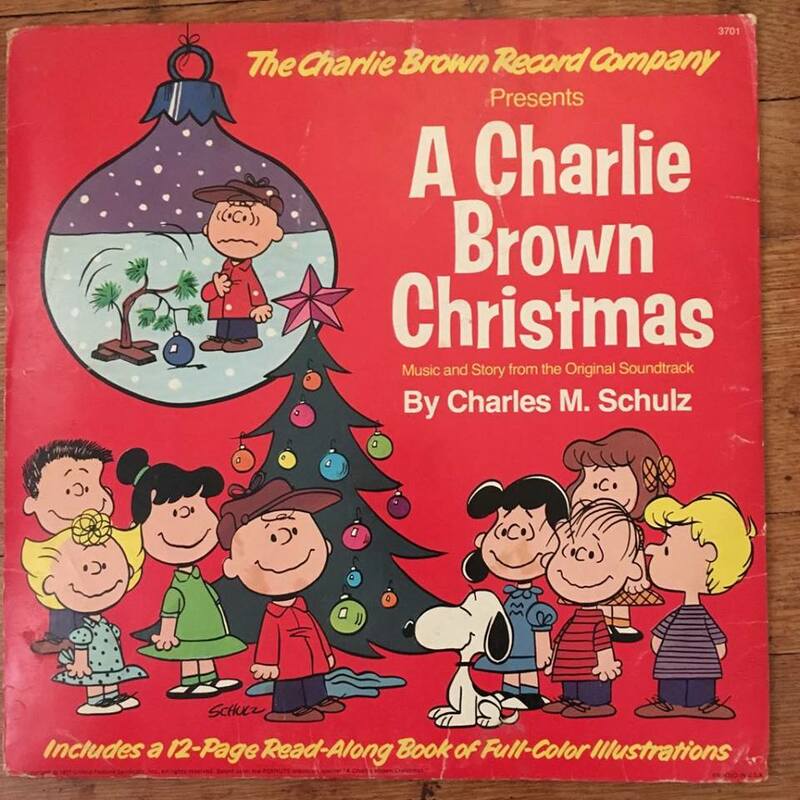 The feature-length TV special was adapted from the popular children's book by Charles Tazewell. I wrote about this TV special and the album a few years back. Click HERE to see it again. The back cover is a flap that opens to reveal more printed information. The previous owner had pulled at the perforated flap and it is detached. However, I still have it and keep the two pieces together. 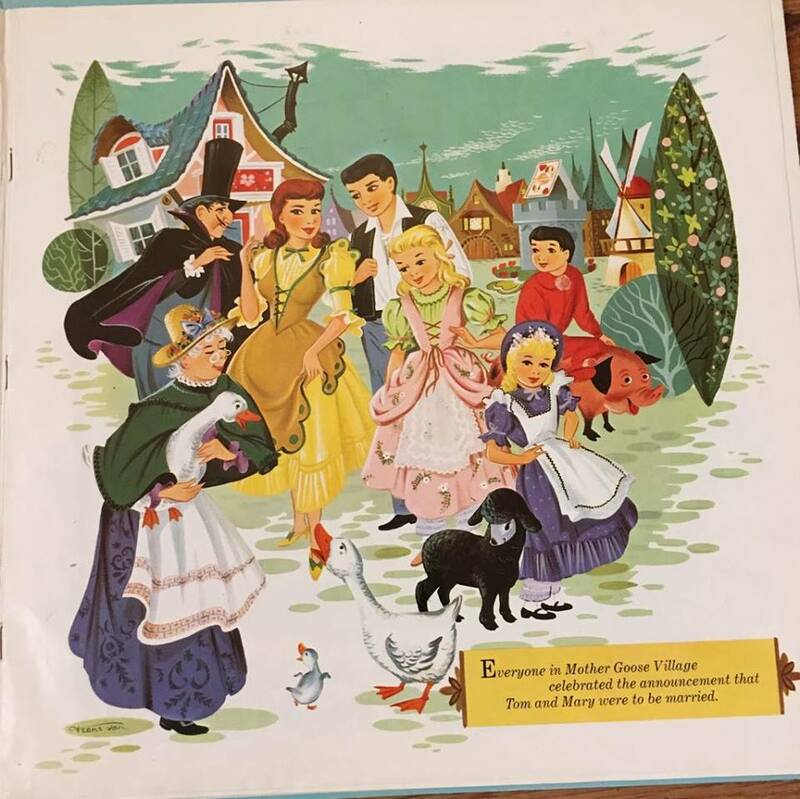 The back flap opens up to reveal a pop-up section with color images from the musical. 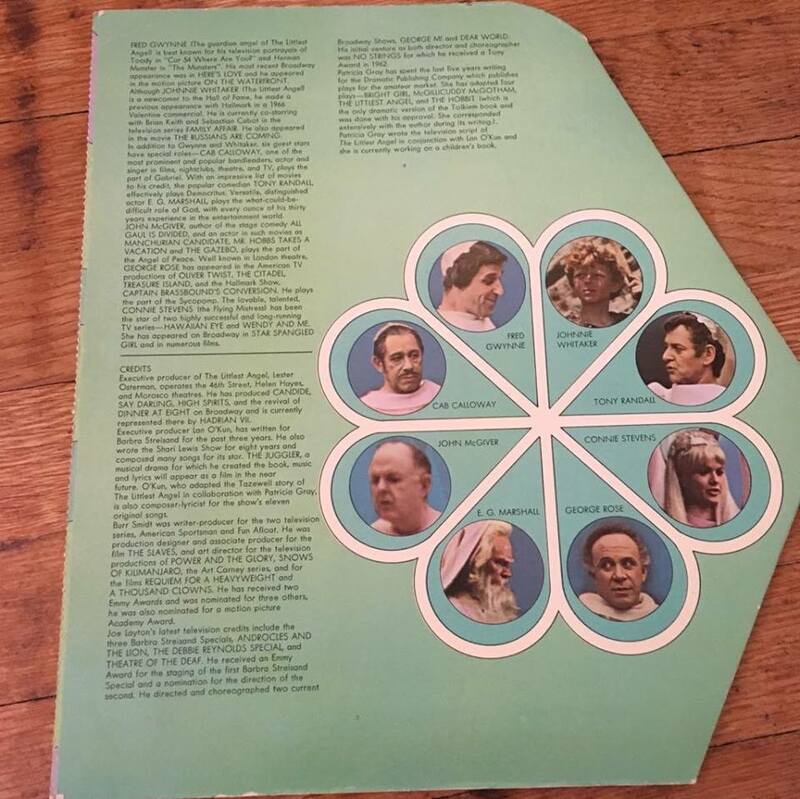 The interior of the back flap includes further credits for the actors and the production staff of The Littlest Angel. 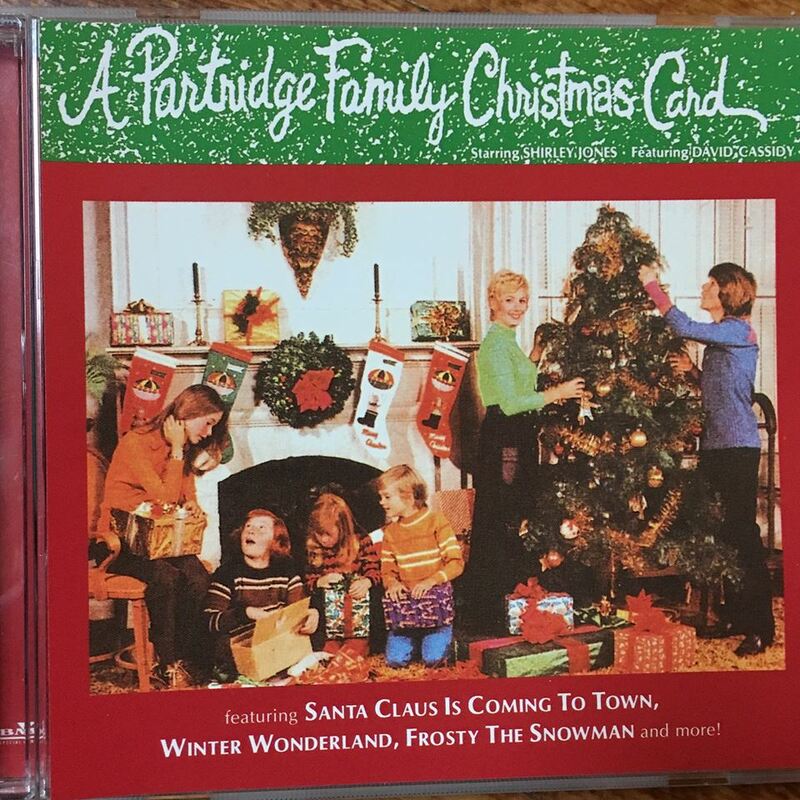 I'm not sure how many other Christmas Hallmark Hall of Fame productions had an official soundtrack release. 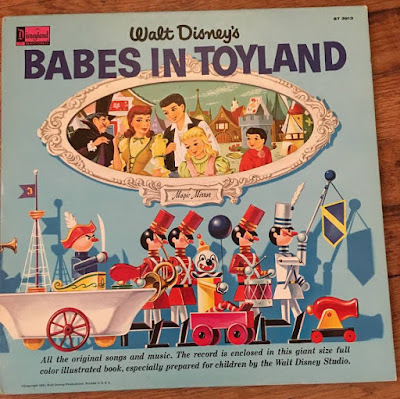 I also have a copy of the Disneyland Record and eleven-page storybook from Disney's 1961 movie Babes in Toyland. The story is narrated by Little Boy Blue, and includes music written for the Disney movie. It is NOT the original soundtrack to the movie, which means Annette Funicello, Tommy Sands, and Ray Bolger are not heard on this album. In fact, you can clearly identify Thurl Ravenscroft as the voice singing Barnaby's (Bolger's character) songs. It's still a fun album with incredible artwork in the storybook's pages. Page 1 of the storybook includes the Mother Goose characters. Page 8 of the storybook with The Toymaker. Love that mid-century design style! 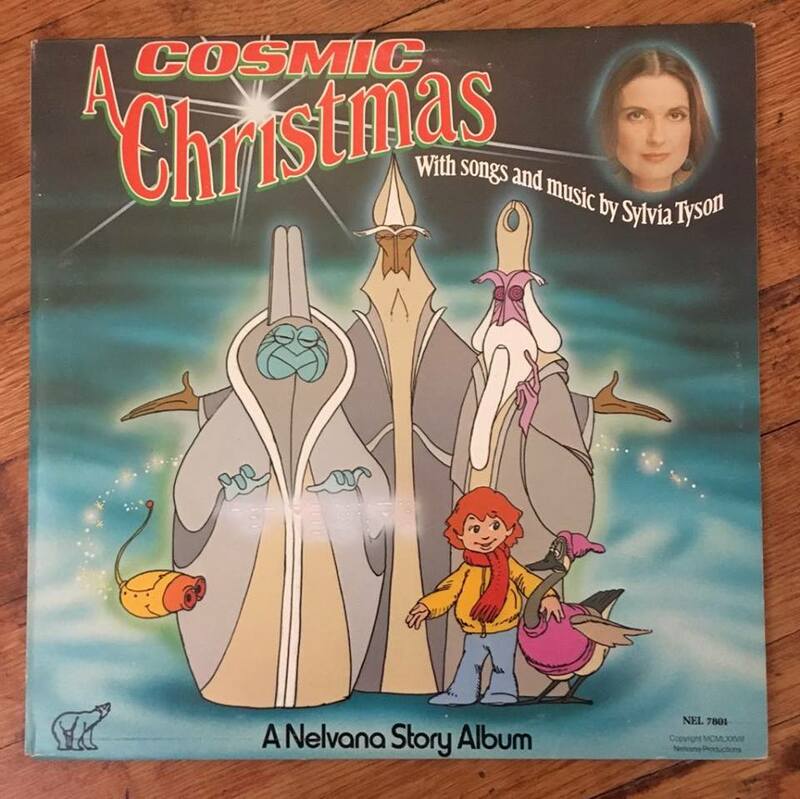 I'm also very pleased to own the story and dialogue LP from the 1977 animated TV special A Cosmic Christmas. The Christmas special was created by the Canadian animation company Nelvana--the same company that created the animated segment within the Star Wars Holiday Special. Yup. This Canadian record came to me from Christmas music collector Jeff Fox. What a gift! Thanks Jeff. The Odessa File starring Jon Voight and Maximilian Schell. 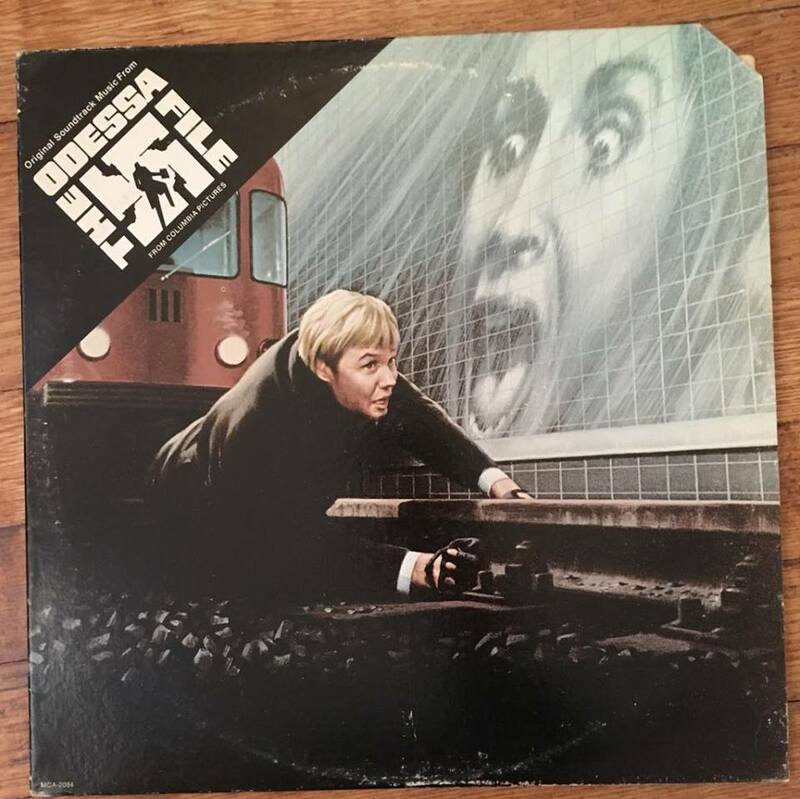 The soundtrack to the 1974 movie The Odessa File is another record in my collection. 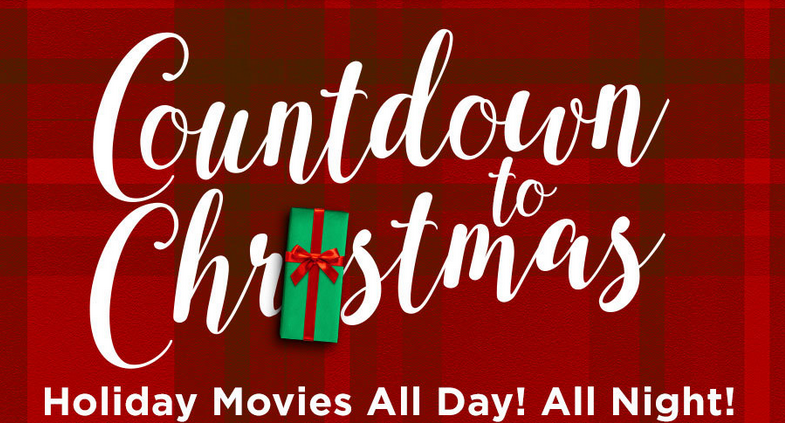 This movie isn't exactly one that will inspire the holiday spirit but the action/thriller is set during the holiday season. 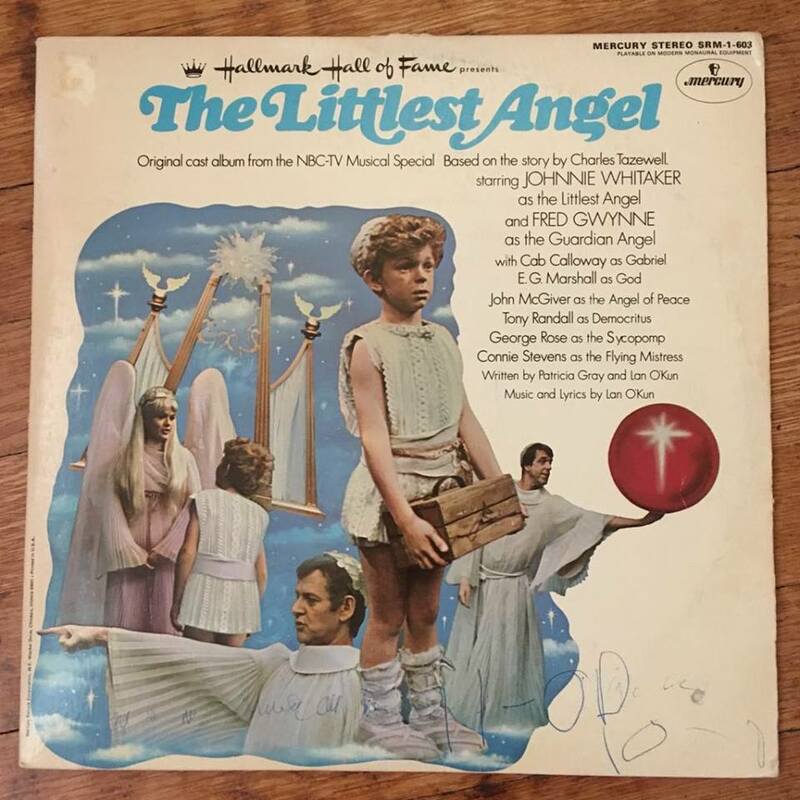 Its unique soundtrack was written by none other than Andrew Lloyd Webber and includes the song "Christmas Dream" sung by Perry Como. The song oozes Christmas--even if it originally appeared in this crazy movie about a journalist hunting Nazis. The album says 1977 but don't be fooled! I knew this was a gem as soon as I found it in the thrift store. The cheap design and lack of information on the cover don't do much to reveal what treasure lies within. 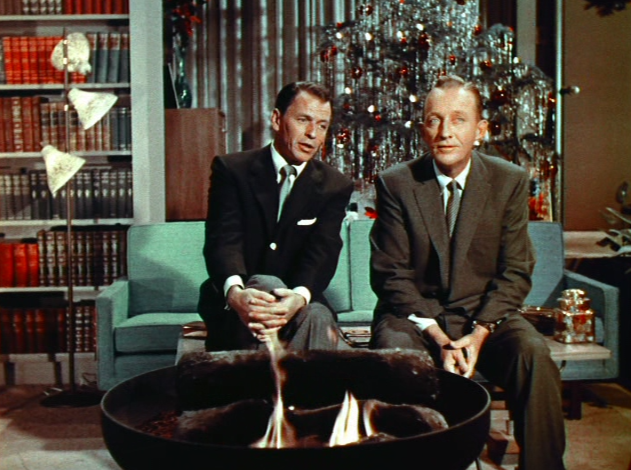 This is actually the original broadcast recording of the 1957 Christmas TV episode of The Frank Sinatra Show. 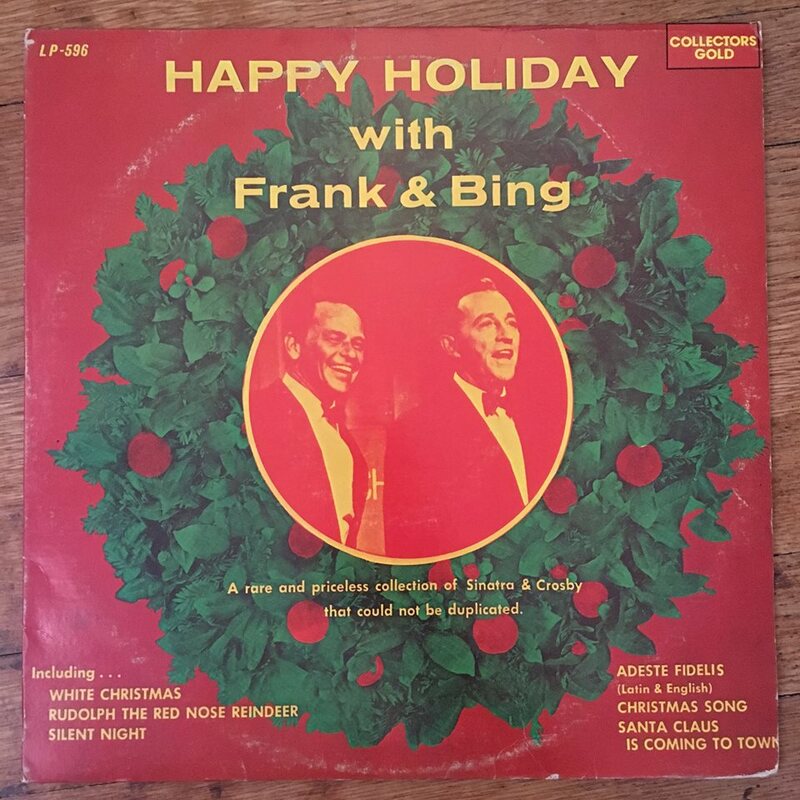 It includes the dialogue and songs by Sinatra and his guest Bing Crosby. I know, right!? That's just Side 1. To see what I wrote about this fantastic 1957 TV program, click HERE. Side 2 is a mystery to me. I believe it is from a radio show. It features Bing Crosby and his four sons Gary, Lindsay, Philip, and Dennis in a Christmas program. The tracks listed on the album cover: Adeste Fidelis, Jingle Bells, Xmas Feeling, Hitch a Ride with Santa Claus, The Snowman, That Xmas Feeling, and Silent Night. If you know more about this recording--especially the radio program, please let me know. It may be Kraft Music Hall. Bing thanks a man named Ken offstage--maybe the host, maybe a band leader. Does any of this sound familiar? The 1957 Christmas episode of The Frank Sinatra Show has been repackaged and released on DVD under the title Happy Holidays with Frank and Bing. Christmas Records, Part 2 coming soon. In addition to Christmas records, I also collect Christmas books with a film and television tie-in. Want to see what I've got? HAPPY NEW YEAR! Before I move on to new content in 2018, I thought I'd take a moment to reflect on the previous year. I collected the top five most popular essays from this website written in 2017. Several of these at the top were surprising to me--some were predictable. Did your favorite discussion from 2017 make the top five? I know I don't say it enough--THANK YOU for reading along. I wouldn't have a top five without you. Now, on to the list. Click on the essay titles below for the link. I already know that this essay I write each year is a popular one--that's why I continue to do it. But it was exciting to see it enter the top five this past year. I usually try to get it posted as early in November as possible. 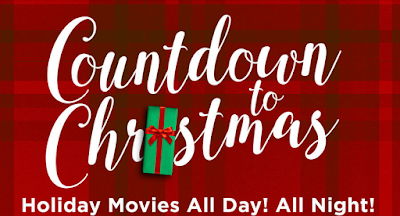 This is the collection of links to network websites and lists of new Christmas movies, specials and programming that airs each holiday season. Do you refer to the list? What could I do to make it more useful? This is another essay in the top five that doesn't surprise me. The annual announcement for our Christmas in July party is regularly in the top five. This is where I introduce the mini-questionnaire and invite everyone to respond with their answers--which I reveal throughout the month of July. Here's the recap of July 2017's responses. I'll announce this upcoming year's questions in June so keep an eye out for it. All are welcome to participate whether you're a regular reader, a casual TV fan, or just a curious passer-by. It's always a lot of fun. 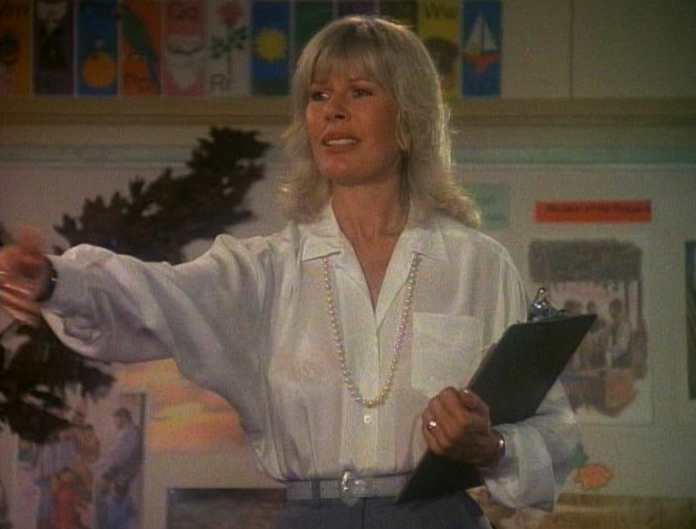 M*A*S*H star Loretta Swit as the pageant's director. The 1983 TV special starring Loretta Swit and Fairuza Balk has a charm all its own. Adapted from the popular book by Barbara Robinson, this hour-long program sweetly combines a difficult family in a small town with the staging of a Nativity pageant in its story. This pairing of the secular with the sacred goes a long way. Despite its age, the program is easily accessible. Grandpa explains to young chipmunks why humans went extinct. The 1939 animated short film entitled Peace on Earth casts a long shadow. Not only is the cartoon made by legendary animator Hugh Harmon but it was nominated for an Academy Award. Most memorable however is its post-apocalyptic story of the extinction of humankind by violence. Its shocking message makes viewers think about our current state and dwell upon the holiday message of "Peace on Earth." Don't overlook my follow-up essay on the 1955 sequel Good Will to Men. It's a re-telling of the earlier story updated for a post-WWII audience. I love provocative entertainment! I'm glad you do too. Mary Tyler Moore Show's "Christmas and the Hard-Luck Kid II"
The first season episode is a classic. Not only does it gather all our favorite characters together for the holidays but we see how important Mary's work friends were to her quality of life. This is another important acknowledgment by TV writers to the importance of friends as family during the holidays--a story element that has become commonplace for contemporary TV holiday viewing. Do you remember reading each of these most popular entries in 2017? As I plan my upcoming schedule of reviews, do you have any requests? Let me know in the comments below. No love for The Real Ghostbusters? That is unexpected!? I was a little surprised by one of the essays from 2017 that received the fewest views of the year. 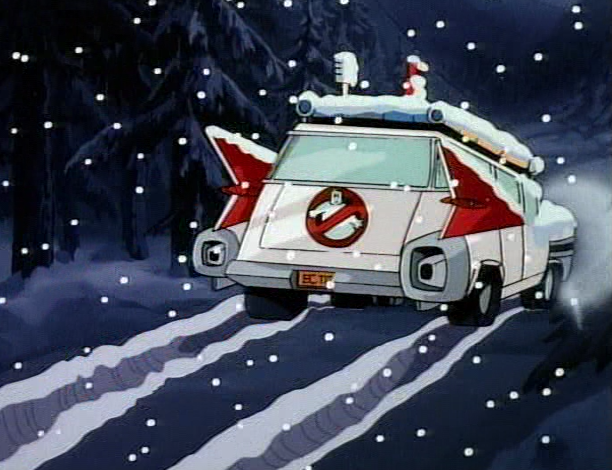 It was my discussion of the 1986 Christmas episode of The Real Ghostbusters--the animated series inspired by the popular movie franchise. The story isn't a simple one. It plays off the familiar Charles Dickens tale by positing that the ghosts of Christmas Past, Present and Future are unknowingly captured by the Ghostbusters, an act that changes how we celebrate Christmas. That strikes me as incredibly ambitious for a 1980s children's cartoon series. It's not a simple adaptation of "A Christmas Carol"--it's more creative than that. As one of the most overlooked essays of 2017, I'm not quite sure what others think about it. Let me know if you give it a second glance. Curious about past Year in Review essays? Check out the 2014, 2015, and 2016 Year in Review posts again. Happy New Year!